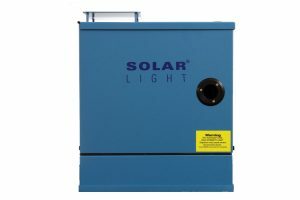 Solar Light Company’s 16S-Series Solar Simulators produce Class A Air Mass 0 and Air Mass 1.5 Emission Spectra to accurately replicate full spectrum sunlight, with 1 sun output intensity. They can be quickly and easily configured by the user to provide UVA only, UVB only, UVA+B, Visible Only, or custom spectra. These instruments are specifically designed to comply with the latest ASTM, IEC, and ISO laboratory standards, and are relied upon by the most prestigious laboratories worldwide. Solar Light’s 300W single output 16S-300-3-AM Solar produces a 3″ (7.5 cm) spot beam Class A Air Mass 0 and Air Mass 1.5 Emission Spectra to accurately replicate full spectrum sunlight, with 1 sun output intensity and over 90% uniformity in the usable area. The output can be quickly and easily configured by the user to provide UVA only, UVB only, UVA+B, or full spectrum sunlight optionally. These precision research-grade instruments are specifically designed to comply with the latest laboratory standards such as ASTM, IEC, and ISO. 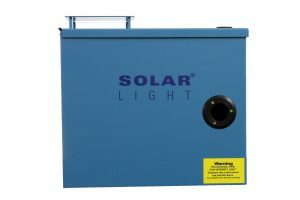 Solar Light’s 300W single output 16S-300-1.2-AM Solar produces a 1.2″ (3 cm) spot beam Class A Air Mass 0 and Air Mass 1.5 Emission Spectra to accurately replicate full spectrum sunlight, with 1 sun output intensity and over 90% uniformity in the usable area. The output can be quickly and easily configured by the user to provide UVA only, UVB only, UVA+B, or full spectrum sunlight optionally. These precision research-grade instruments are specifically designed to comply with the latest laboratory standards such as ASTM, IEC, and ISO. Solar Light’s 300W single output 16S-300-0.8-AM Solar produces a 0.8″ (2 cm) spot beam Class A Air Mass 0 and Air Mass 1.5 Emission Spectra to accurately replicate full spectrum sunlight, with 1 sun output intensity and over 90% uniformity in the usable area. The output can be quickly and easily configured by the user to provide UVA only, UVB only, UVA+B, or full spectrum sunlight optionally. These precision research-grade instruments are specifically designed to comply with the latest laboratory standards such as ASTM, IEC, and ISO. Solar Light’s 150W single output 16S-300-1.2-AM Solar produces a 1.2″ (3 cm) spot beam Class A Air Mass 0 and Air Mass 1.5 Emission Spectra to accurately replicate full spectrum sunlight, with 1 sun output intensity and over 90% uniformity in the usable area. The output can be quickly and easily configured by the user to provide UVA only, UVB only, UVA+B, or full spectrum sunlight optionally. These precision research-grade instruments are specifically designed to comply with the latest laboratory standards such as ASTM, IEC, and ISO. Solar Light’s 150W single output 16S-150-0.8-AM Solar produces a 0.8″ (2 cm) spot beam Class A Air Mass 0 and Air Mass 1.5 Emission Spectra to accurately replicate full spectrum sunlight, with 1 sun output intensity and over 90% uniformity in the usable area. The output can be quickly and easily configured by the user to provide UVA only, UVB only, UVA+B, or full spectrum sunlight optionally. These precision research-grade instruments are specifically designed to comply with the latest laboratory standards such as ASTM, IEC, and ISO.